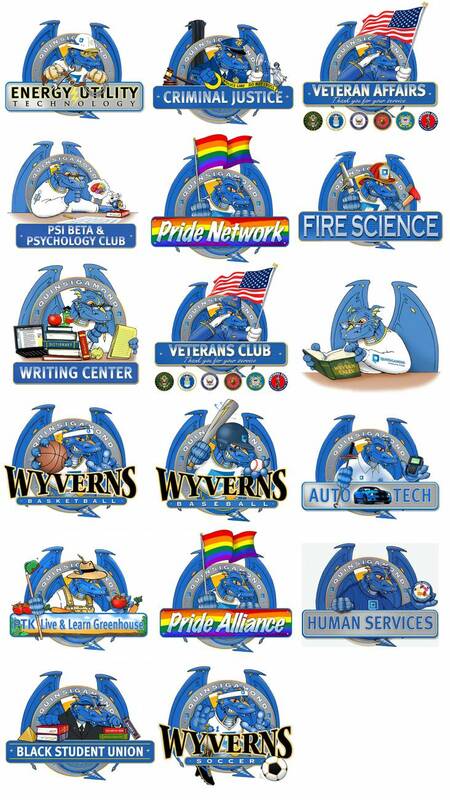 Quinsigamond Community College’s mascot is the Wyvern. The Wyvern is a mythical, winged dragon that was viewed as the ancient protector of Worcestershire, England. As the Wyvern protected Worcestershire, England, QCC protects Worcester, MA. The Wyvern is fierce, loyal, intelligent, strong and resourceful - a symbol for community guardianship as educator of teachers, health care providers, human service, automotive, business, HVAC, insurance, manufacturing technology, engineering, law enforcement, safety and fire personnel, computer science and electronics industry professionals, in addition to being major contributors of the economic well being of the City through an educated citizenry. QCC provides a variety of wyvern themed products and supplies. Visit the bookstore or the Athletic Center for more information on where you can purchase wyvern items. Have you seen the Wyvern? Email jmartin [at] qcc.mass.edu to submit images and a location.